At times I wonder how I manage to look at a board and not see the obvious. Take the below. I felt drained when presented with Rg2+, and yet it was so simple. Concentration and observation, I think. 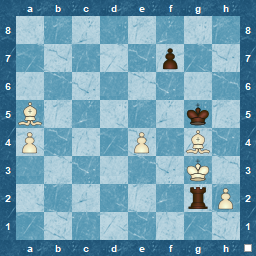 White to Play, and win a .....? Black saw the discovered check from the Rook, but missed it was a double-check, so his intended Bxd6 isn't possible and Kd8 is forced. 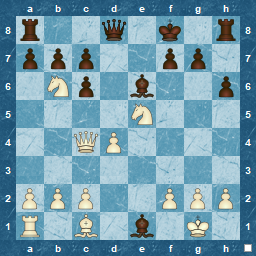 White to play 11 : Queen exchange ! One of those tactical puzzles that its good to see in real life ! Maybe 'combination' isn't the precise word here, as I'm sure it has a particular definition, but its good enough for me. The European Team Championship is on in Crete at the moment, and, in the time I found to watch it I was lucky enough to see a very nice finish by Sophie Millet in her game against Borka Franciskovic. 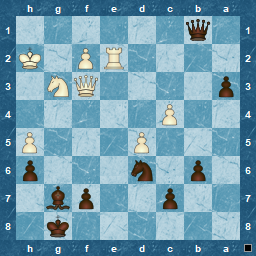 Black has just played Qd8 and after a couple of minutes thought White replies with a simple move, but a devastating combination follows...mate in 5. Another good combination, this time from me. I've mentioned before that, although I don't always play them, these days I tend to see more interesting moves bubbling up from my subconscious. This time I calculated a bit more and decide to try it. Not a mate, but more than enough to win, and very enjoyable to play. Black didn't play the optimal moves, but that's what happens in amateur chess, especially when surprised with an unexpected thrust ! 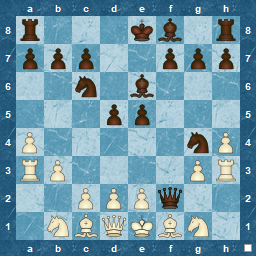 I managed to calculate 4 and half moves on this, which put me in a winning position, so I gave it a go ! I'm sure we've all experienced the downside of blitz chess. 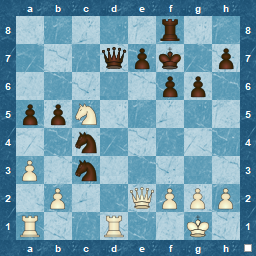 Not the mistake you make because of a lack of time or calculation, but the painful game where you realise after a few moves that your opponent is a complete novice at chess and either you choose to resign, to save more suffering on both parties, or you play on and prove that you know what you are doing ! 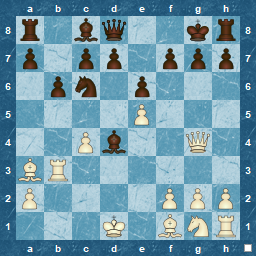 Below a recent 'play on' choice which produced the obvious result in 8 moves. 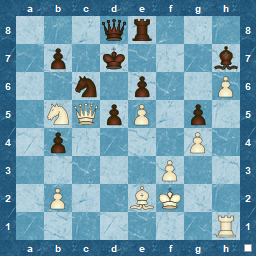 It was Rh3 that confirmed I was up against an almost complete novice, although the big clues were 1.h3 and 2.a3, despite the fact that these are sometimes played by bullish players as a psychological prod to the opposition. As minor compensation the next game in the session gave an opportunity for a nice mate. 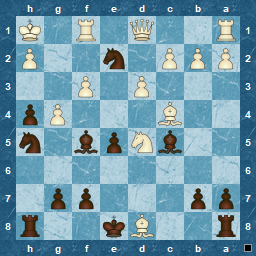 Yes, I realise Black is way ahead on material, but serious blitz players rarely give up ! Calculation in chess is a wonderful skill to develop, as well as being an essential one in almost any position. Its probably a major difference between the various levels of chess player, with a GM seemingly displaying a grasp of calculation that is far in excess of anything an amateur can achieve. This is perhaps the key : a GM is a professional chess player, so although a GM displays this incredible skill, it is probably not innate. 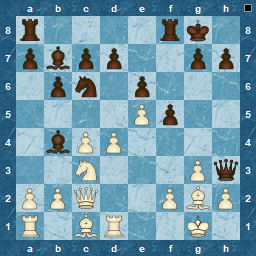 There might well be a natural core available, but I suspect it is extensive practice and experience that allows the skill to develop to the levels seen in GM-play. I found the below demonstration and exposition of calculating skills by GM Nadezhda Kosintseva to be quite amazing. She takes a position (shown below) and proceeds to analyse it deeply and fully, bringing out a remarkable amount of information from what appears to be a straightforward position at first glance. Its a long video ( an hour ) but worth watching for the way she analyses and how the methods can be learned. Helpful ( or maybe, educational ) to think about the position first, before watching. Although I wonder about the direct link between training tactics, and actual improvement over the board, not having the time ( or direct experience) to perform a controlled self-experiment to check this, I can go only by impression and feeling. Using these, I feel the biggest improvement is in my behaviour at the board. Generally, I take more time to look around it board before I move, and try to check more often if tactics are present. This doesn't mean that I always "see" the tactics on the board, but I feel sure it helps my game overall. Sometimes, though, my mind deceives me. It sees a solution, and something clicks that overrides the trigger to check again, resulting in a poor move. For example, in this Chess Tempo problem below, I saw what had to be the solution, as I was looking for checkmate. 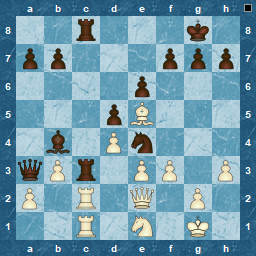 I played and was wrong, the solution was about winning material ( so if you already thought 37...Nc5, intending Nd3 to cover the King's escape square, just re-think that ! ). 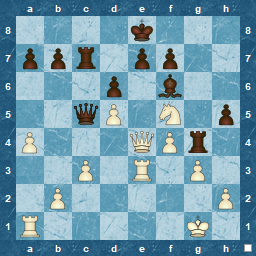 Maybe my chess mind is still in its 'romantic 19th Century style' for a lot of the time and wants flamboyant and crowd-pleasing checkmates, rather than steady modern moves gaining material or positional advantage ? Who knows. I can take some small comfort in the fact that 4500 others ( a third of the attempts ) made the same mistake on the above problem, but it doesn't help that much, and that comforting 'all-failures-together' feeling lasts even less. 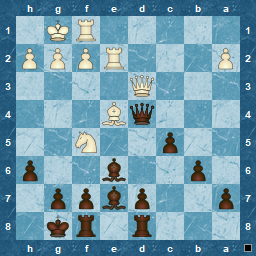 Below is a rapid game played recently. My play had been to focus along the d-file ( in fact aiming at the d8 square) and also re-position pieces that were preventing this. When Black played the natural 19...Rd8, my tactic-sense spotted what proved to be a resign-provoking move ! Not too hard to see, but good to spot it, and even better to play it ! 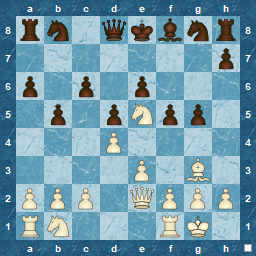 I know that if this was in a blitz game, there would be a very high chance of me failing to play this correctly. I think its a great problem, where a solution jumps out at you, but when you calculate it, you see the lurking issue that stops your idea and have to re-think. My re-appraisal found a better solution, then I had to go through it again as, in my mind, I saw the king on the 'wrong' square, so that solution didn't work either. Except it did, when I adjusted my vision ! A holiday, and other less pleasant distractions, kept me on a low run-rate with Chess Tempo, and has driven my RD ( Rating deviation ) up, meaning that failures cost a lot of rating points ! However, a recent dedicated run of 20+ problems in a single session has put me back on track, gaining few points with it, but some interesting positions. I suspect tiredness played its part in taking far too long on the below. 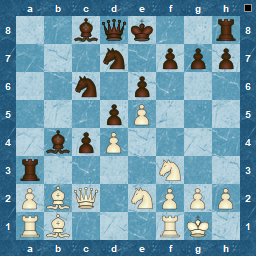 The point of the problem was whether White could take the hanging Rook on a3. 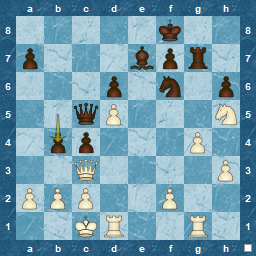 There is no White mate ( Ng8 will stop it ) and the passed pawn cannot win the Rook via any Queen sacrifice, but I could not get past the fact that after 1. Qxa3 Qc1+ and Black would regain the Rook. Enjoy, and here's the solution. If this isn't in ChessTempo's database already, I am sure it will arrive soon. As with so many "real game' tactics, its always easy to see after the fact. Doubtless Kasparov had little time left on his clock if the reports of his comeback tournament are to be believed ! I admit that, despite my desire to understand, and appreciate, "super-GM chess", most of the time, even with explanatory commentary from a GM 'live in the studio', it is beyond my grasp. Richard Réti, understandably given his position as the inventor of one of the pivotal hyper-modern opening systems, had a different opinion of positional chess, at least later in his life. I picked up Harry Golembek's "Réti's Best Games" second-hand recently ( 6 Euros for a 1974 Dover paperback, which seems expensive until you see that the same thing reaches 265 GBP on Amazon ?!) and in English descriptive notation : some nostalgic times ahead when I read the games ! 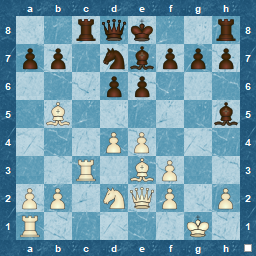 Réti wrote...."Something like this is not only pretty, but has the advantage of being much easier to understand than a difficult positional game. 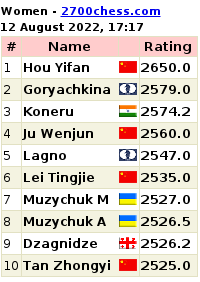 Thus it is only natural that the greater part of the chess world should be displeased with the fact that one seldom sees anything similar happening in modern master tournaments. But the blame should be laid, not on the masters, but on the tournament organisers. The latter must decide to invite to great-master tournaments some Pobedins as well. Then the public would see so many sacrificial combinations of this type that they would soon find them as banal and uninteresting as the writer of these lines - please forgive me for this confession - finds this Queen sacrifice." Tartokower, however, described it is as "splendid", at least according to the Daily Express ! 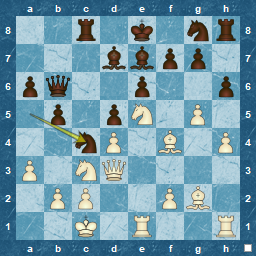 From my amateur level of chess, my heart certainly sides with Tartarkower on this, at least on the finish of the game, but my head is firmly with Réti for the general approach. As a problem, the solution is simple, even trivial ! but see the full game below. Lukomski could have played 14...Qg5, and made Pobedin fight for it, but that would have been pointless, since the game is already over. 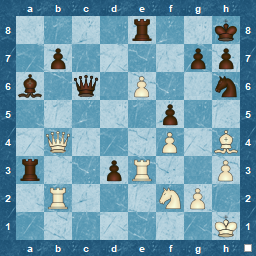 He lost it with the abysmal and thoughtless blitz-style move 11 of Bxd4, which, surely, even Tartakower would never have described as 'splendid' ! 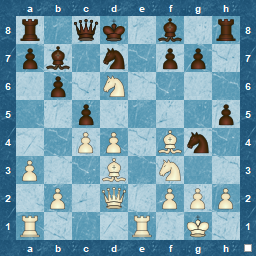 I exceeded my old "highest rating" in standard tactics this week after solving the below problem. Not only that but I also manged the solution in less than the average time of 4m 5s, and calculated the whole sequence of moves required. 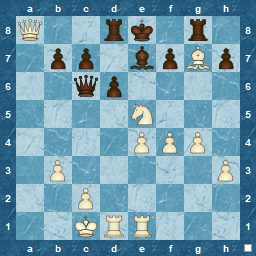 Well, I was pleased with myself, anyway, especially as in the game it was taken from, White missed the tactic. I was also happy with finding the solution to the following, as it was another area I fail often, the quiet move ( ah, given you a hint there). For this one, Chess Tempo required an extra move for a change. In many CT problems, having calculated a sequence of moves, when you play them, the solution ends much earlier than expected, leaving you feeling a bit cheated, as if the time hasn't been invested properly. 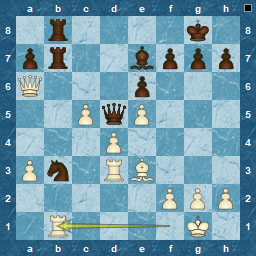 This is particularly frustrating when CT stops after one move played. Having spent some time satisfying yourself that it is correct, you feel you want to show CT that you have actually worked it out, and not just guessed ! I spent some time on the 'wrong' solution, but have to give myself credit, in that I looked for something else, since the "solution" I had wasn't really good enough. A fresh look produced the required result ! Its August, Summer holiday-time, and the majority of my work-colleagues are either on them, or about to take them, so probably a good time to recap on what I’m doing in the chess arena. ChessTempo (CT) is ongoing, and with the change of approach I made, ie not focusing completely on what CT calls rated “standard tactics”, its proving to be a success for me. So far, I have managed 47 days continuous tactics, averaging about 40 minutes per day. Weekends more, weekdays less, but spending time daily on some sort of tactics training has done me good. I can’t put that in rating terms, but I can say that I have reduced the tendency to re-capture automatically, I appear to see the opportunity for targets better, perhaps meaning a geometrical view on combinations such as pins and skewers, and it seems that more ‘out-of-the-box’ ideas are bubbling up to the surface as well. Here, for example, although I ended up playing 16...Ra8, I actually considered the exchange Rxf3, which I doubt I would have thought about 6 months ago. Its not a bad move, but I didn't feel confident enough playing it at the time. 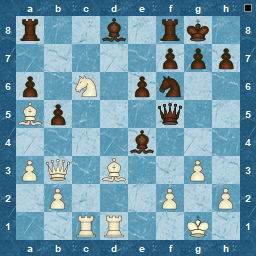 Of course, there are days when I feel there is not enough time to do justice to a number of new tactics problems, in which case I have a set of ‘failed’ problems that I can practice with, consisting of about 15 or so that I can solve in less than 10 minutes. I try to include at least one standard rated problem each day, but its no longer essential, as long as the daily workout is done. Apart from tactics, I’m also working my way through Valeri Broznik’s “Techniques of Positional Play” after it was recommended to me by my local chess shop. So far still in chapter1 – Restricting the enemy pieces – but it does cover 7 of the 45 techniques he discusses in the book. Lastly, to cover the opening phase of the game, I’m also working through Nigel Davies’ DVD “b6 for practical players”. Although ostensibly a DVD on Owen’s Defence ( 1...b6) , he is actually showing how to use b6 as a useful transpositional move within your existing repertoire, or a move to ‘spruce up your repertoire’ and throw your opponent onto his own resources early in the game. He particularly shows how it can be used as an adjunct to a French Defence (which is useful to me, since that it what I play as Black) but also offers what he calls economical or theory-light lines in the actual Owen's and in the English Defence against d4, c4 and Nf3. In this way, the DVD can also offer a relatively complete Black repertoire, should you wish it. In my opinion, Davies has an excellent presentation technique, and is a great teacher, especially as he aims most of his material at the player who has limited time to study. To finish off, here’s an example that he gave of a tactic arising from a Tony Miles game. Another tactical motif weakness has shown itself and it is proving a slippery one to grab hold of and digest. Its important to understand how ChessTempo defines it, since that will affect the way you view such problems. In particular it's the phrase "...in order to gain a more favourable material balance at the end of the sequence of captures" that I feel is key. It may be obvious, but the action of solving problems on ChessTempo should be to arrive at the solution via a large dose of logical analysis, with perhaps a sprinkling of intuition/experience, rather than the other way around. In which case a Desperado problem might seem to be the opposite, ie illogical and emotional, as its name suggests a situation where you hit out desperately for a solution. Actually, as I have discovered via my many initial failures, it isn't illogical at all. Unlike the historical "Desperado", the outlaw of the American West, the solution is to gain a benefit via planning and analysis of exchanges that eliminate the main threat, and leave you with material up or an overwhelming position. That's the clue as to why this has arisen as a weakness for me, because most of the time it will involve the motif of counting, and ensuring that the move order of the exchanges is correct as well. After all, there's no point in blowing a hole in the jailhouse, if the timing means that the prisoner is still standing against it ! 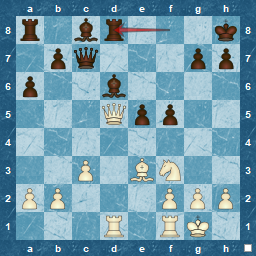 The White Queen is under attack, while at the same time White hits the Black Queen, both involving a knight. 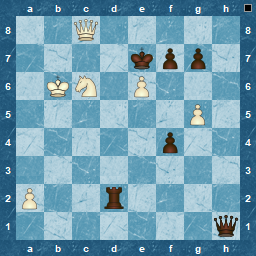 You can just exchange the Queens, but that won't fulfill the requirements of the motif, namely "more favourable material balance at the end of the sequence of captures". I saw the key idea, but jumped to a conclusion and didn't re-check. I was wrong via a move -order error. Seemed to me that I couldn't go wrong in this case, and I didn't ! Since Desperado reminded me of the Eagles, and I couldn't find their BBC "Whistle Test" performance, here's something even better ! Here's an example of one of my 'problem areas', classed as "Pins" by ChessTempo. The current problem rating is 1455 and average time to solve is 2 minutes . 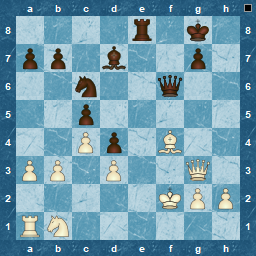 I took a little longer than average, and saw the main thread and solution, but not the depth that chesstempo gives as the full continuation after the solution (and here I mean 11 moves in this case ). Its also worth noting that the tactical motif isn't always straightforward. It will be there, but not always the obvious one you see on display (or even if it is on display). Often the solution is to extract yourself from it, or to create it for your advantage, all of which add variation to the solutions. The comments, as always, are illuminating, in that there is a wide range of thinking on display. As a paid up member I see the full solution, with all ( well, a lot ) of incorrect moves and variations available to check, which answer many of the comments posted. However, there is often an instructive comment giving an underlying explanation, expanding on the variation solutions given : well worth reading. 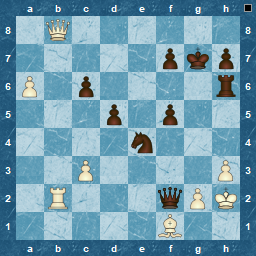 I realised I have posted many 'Black to Play' positions, so for a change, here is 'White to Play": and mate in 4, courtesy of the London System and a naive opponent. Yes, this is just a blitz game, but it was still amazing to see Black's last move of 9...f5. 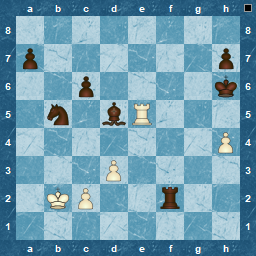 I didn't need to think much before moving, and after that, the mate just played itself. This is a simple, and obvious, example of not thinking in the opening. Black just wanted to set up his "system" of crenellated pawns, saw a direct attack possible on the bishop , and played it. Result misery...at least eventually. You don't need me to post the solution ! 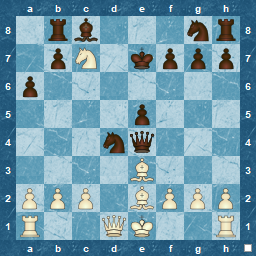 After the psychological disaster of my return to ChessTempo a few weeks ago, I re-appraised how I could use it. Now, instead of just using the 'Standard' set and allowing a rating to "judge me", I have also created what are called "personal" sets and am training with them. The statistics on the x-hundred problems I tried initially, gave me two main areas where I was failing, namely what ChessTempo calls "Counting" and "Pins". So now I have custom sets that I can use, and its not such a major ratings hit if I fail on a problem. I also created a set of standard problems that I have always failed at, and went through that too ( in fact going through it for the second time, as there are still about 60 problems I have not solved correctly ). Although this might be viewed as an indirect approach by not being rated via the standard set, it has encouraged me to keep practicing tactics on an almost daily basis for 15 -30 minutes, so I would say the end (improving my tactics skills ) justifies the means employed ! An unexpected bonus with using these personal sets is that most errors are usually associated with not "seeing" the entire board, ie missing a threat or a piece, rather than with the problem motif itself. Somehow, I think that points to the probable root cause of most missed tactics or blunders ! Here's a neat problem taken from one of my personal sets. It is so simple once you see the motif, but was very satisfying to solve. The ChesssTempo link ( with solution ) is here. 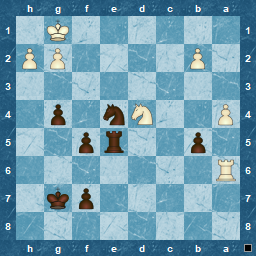 Black to play : best move ? 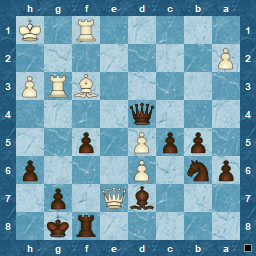 What is Black's best move ? I almost found the correct line, but under time pressure missed the killer move, and faded into an advantage for Black, rather than a win.